Biography: Faith and Glory Church is located in the town of Narsapur which includes more than 500 villages. The church began in 2003 and has grown to five churches, each having congregations of over 100 members. 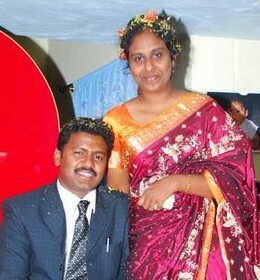 Param Jyothi is the associate pastor of the churches. The church has a very active children and youth ministry with regular weekly services as well as children's retreats on holidays, youth retreats, singing and talent competitions. Param Jyothi tells us, "We have a passion to save India. The gospel should reach all over India." They also emphasize training pastors and leaders, retreats, gospel through sports ministry and feeding orphans in the orphanage. Strengths: Param Jyothi plays the keyboard, sings and leads worship as well as being a gifted teacher and preacher.